Julie Gonzales is the policy director for the Meyer Law Office, PC, and also serves as a paralegal for clients in removal proceedings. 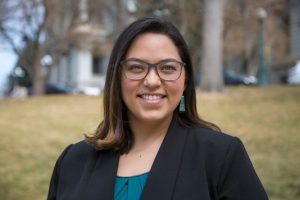 She conducts Know Your Rights trainings in community, educates lawmakers on the impacts of the policies they propose, and often comments on immigration issues in the media. She has worked in various capacities to build power around immigrant justice, educational reform, and workers’ rights. Julie is an experienced bilingual capacity-building trainer and facilitator and has a decade of community and youth organizing experience building grassroots political power with organizations such as the Colorado Latino Forum, the Colorado Immigrant Rights Coalition, Reform Immigration FOR America, Padres y Jóvenes Unidos and the Front Range Economic Strategy Center. Julie has also served on the boards of United We DREAM, the Yale Latino Alumni Association, and the Café Cultura Collective. She received her undergraduate degree in History and Ethnicity, Race, and Migration from Yale University in 2005. Born on the San Carlos Apache Reservation in San Carlos, Arizona and raised in the borderlands of south Texas, Julie is proud to call Colorado home.